This on-line version of the brochure is designed to help you understand how you may be exposed to these chemicals in your work, and encourages you to use proper protection to minimize exposures during all phases of firefighting. There are very few studies on women firefighters and the risk of female cancers, including breast cancer. Other studies of workplace exposures to certain chemicals have shown some evidence of a higher risk of breast cancer. Some of these chemicals are also encountered in firefighting (see Formaldhyde and Benzene, below). Hence, it is prudent to take precautions against exposures to these chemicals. For many other chemicals, studies have not yet been done on workplace exposures and the cancer risk of women. Because cancer biology is similar in people and laboratory animals, animal studies are one of the important tools used to identify chemicals that may be a cancer risk for humans (see Laboratory Animal Studies, below). Formaldehyde – Most studies on formaldehyde exposure in the workplace and cancer risk have been done in men. In women exposed to formaldehyde, two studies have shown a higher risk of developing or dying of breast cancer (Cantor et al., 1995; Coyle et al., 2005). Because of overall evidence of increased risk of several types of cancer, and potential exposure in fire scenarios (IARC, 2006), it is important to take protective action to minimize exposure to this chemical. Benzene – Breast cancer risk was higher in several large-scale studies of women working in jobs exposed to high levels of benzene (as an organic solvent) (Hansen, 1999; Petralia et al., 1998). More studies are needed on whether benzene inhalation in other professions affects the risk of breast cancer. The National Toxicology Program has found the following chemicals capable of inducing mammary tumors in long-term cancer studies conducted in rats and mice (NTP, 2007). All of these chemicals can be generated in various fire scenarios. 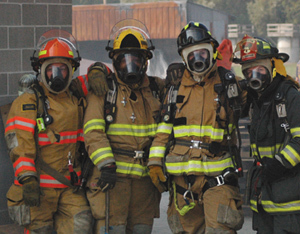 Personal protective equipment, especially Self Contained Breathing Apparatus (SCBA) needs to be worn at all phases of firefighting, since potential exposure to chemicals that may increase breast cancer risk in all types of non-structural and structural firefighting activities (Grant, 2007). Isocyanates - generated from polyurethane found in mattresses, sleeping bags, clothing, foam, upholstered furniture and paints (Dalene et al., 1997). 2,4-Toluenediamine – generated from thermal decomposition of foam made from toluene diisocyanate (Dalene et al., 1997) (see isocyanates above). 1,2,3-Trichloropropane – generated from thermal oxidative degradation of “Tris,” a flame retardant that was used on fabrics (ATSDR, 1992). Benzene - generated from epoxy resins (Orzel, 1993), and the decomposition of polyester foam and fiberfill (ATSDR, 1990) found in bedding and upholstery. Generated from polyvinyl chloride (PVC) (Orzel, 1993) used as coating in wire and cables, in electrical equipment (Fabian and Gandhi, 2007), and in window treatments (drapes and blinds) and wall coverings. 1,3-Butadiene - detected in smoldering, structural fires (Austin et al., 2001). Formaldehyde - released from permanent press finishes on fabric treated with melamine-formaldehyde resins (Eckhardt and Hindin, 1973), and from simple acrylics found in paints and bed clothing (Fabian and Gandhi, 2007; Orzel, 1993), and epoxy coatings. Isocyanates - generated from polyurethane found in mattresses, sleeping bags, clothing, foam, upholstered furniture, and paints (Axford et al., 1976; Dalene et al., 1997; Fabian and Gandhi, 2007). Isoprene - released from the pyrolysis of natural rubber (Taalman, 1996). Benzene - detected in smoke from house and municipal fires (Austin et al., 2001; Golden, 1995; Jankovic et al., 1991; Lees, 1995). Generated from thermal decomposition of polypropylene plastics used in housings of small kitchen, bathroom and office appliances (Fabian and Gandhi, 2007; Orzel, 1993); from polyester found in bed sheets, mattresses, carpeting and clothing (Fabian and Gandhi, 2007; Orzel, 1993); and from polyvinylchloride (PVC) used as a coating for wires and cabling, in plastic switches, wallpaper, and window treatments (drapes and blinds), and PVC plumbing (Fabian and Gandhi, 2007; Orzel, 1993). Formaldehyde - released from permanent press fabric treated with melamine-formaldehyde resins (Eckhardt and Hindin, 1973), and from thermal decomposition of polyethylene (Orzel, 1993) used in building materials (e.g. some plastic bathtubs). 1,3-Butadiene - detected in smoke from municipal structural fires (Austin et al., 2001; Himmelstein et al., 1997). Benzene and Formaldehyde - released during salvage tasks performed during and after a fire; released during overhaul tasks, including pulling apart walls, ceilings and floors, and removing furniture to find and extinguish hidden fires; and released during delayed off-gassing after chemicals adsorbed onto masonry and concrete (Bolstad-Johnson et al., 2000; Donahue, 2006; Jankovic et al., 1991). 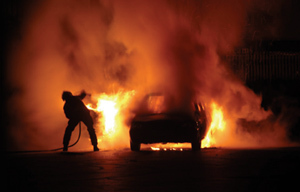 Methylene chloride - detected during overhaul of municipal structural fires (Bolstad-Johnson et al., 2000). 1,3-Butadiene - released from the cellulose and other components found in wood (Morrow, 2001; Reisen et al., 2007; USDHHS, 2004a). Benzene - detected in smoke released during fire training exercises involving buildings or motor vehicles (see Smoldering / Flaming Combustion and Tire Fires) (Golden, 1995; Jankovic et al., 1991; Lee and Suzuki, 1979; Lees, 1995). 1,3-Butadiene and Isoprene - released from wood during active pyrolysis and during smoldering combustion and overhaul (Morrow, 2001; USDHHS, 2004a; USDHHS, 2004c). Benzene and Formaldehyde - detected in the smoke of wildfires (Harrison, 1995; Lees, 1995; Reisen et al., 2007; USDHHS, 2004b). Isoprene - released from petroleum in oil fires (USDHHS, 2004c). Nellie J. Brown, M.S., C.I.H. Funding: Support for development of this brochure was provided by the New York State Department of Health and Department of Environmental Conservation. The content of this brochure is the sole responsibility of the authors, and recommendations do not necessarily reflect the views of our funders or Cornell University.